Bananas is the name of Greg's fanbase. 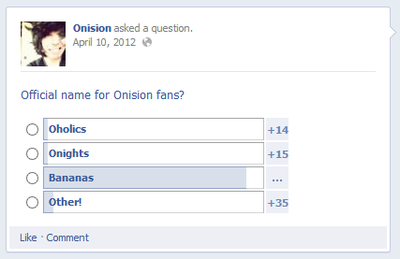 In 2012, Onision fans started suggesting names for their fan base. Many hopped on board calling themselves "Bananas", based on Greg's "I'm a Banana" viral hit. Before making it official, Greg made a Facebook poll and suggested a few other names, all including parts of his username Onision. Banana was the clear winner and they were known as Bananas since that point. Sometime between 2012 and 2014, Greg began using a video outro in his YouTube videos where he would say, "We are not robots. We are not slaves. We are Banana Nation." (Source) Although he no longer uses it, the quote is still being used by Bananas. They usually write the quote accompanying a rant about how they believe people don't like Greg because of his brutal honesty and dark comedy style, something that they can handle. The quote may have been created by Greg due to so many people accused him over the years of treating his fanbase the way a cult leader treats their followers, as well as comparing his fans to cult members. This page was last modified on 27 December 2015, at 09:51.